Move oven rack to low position so that tops of pans will be in centre of oven. Heat oven to 350 ºF. Grease bottoms only of 2 loaf pans, 8 1/2x4 1/2x2 1/2 inches, or 1 loaf pan, 9x5x3 inches. Bake 8-inch loaves about 1 hour, 9-inch loaf about 1 hour, 15 minutes, or until toothpick inserted in centre comes out clean. Cool 10 minutes. Loosen sides of loaves from pans; remove from pans and place top side up on wire rack. Cool completely, about 2 hours, before slicing. Wrap tightly and store at room temperature up to 4 days, or refrigerate up to 10 days. How-To: No buttermilk on hand? In an emergency, you can mix 1 1/2 teaspoons lemon juice or white vinegar and enough milk to make 1/2 cup, or substitute 1/2 cup plain yogurt. 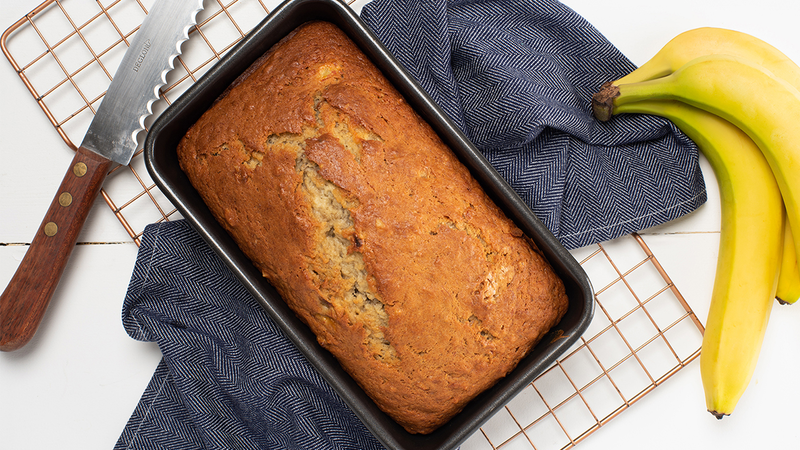 Variation: Mini Banana Breads make great gifts! To make, grease bottoms only of 10 miniature loaf pans, 4 1/2x2 3/4x1 1/4 inches. Divide batter among pans (about 1/2 cup each). Bake 30 to 35 minutes. Variation: Stir 1/2 cup chocolate, peanut butter or butterscotch chips into the batter for mouthwatering flavour combinations.